Last week I posed the need for questions to ask a new heatlh care provider. Well, my appointment was yesterday, and I am quite pleased with the attention given me from Erica Blackwell at the Eye Institute in Morgantown. Although not a professionally trained MS Specialist, Erica epitomizes the passion that special health providers exhibit for the MS War. Q: Why are my feet different colors? What causes this? What can I do? A: Possible circulation issue since the discolored leg is the "affected" side of my body. Compression socks could help. Physical therapy (which she prescribed) will possibly get me back on track with a more physically active lifestyle. Since I got a massage today that included reflexology, I agree that circulation could be the culprit. For a few hours today after the appointment, my legs nearly matched. So, yes, this will be a regular indulgence for me. A: Being on a prescribed treatment is the best advice. When I verbalized my research on Aubagio, she did not disagree that this was a "good" drug, but then she surprised me with her preference: Gileyna. There is nothing truly positive to say about any drug, but I am looking for the lesser of all evils, so I am prepared to listen to any and all you have to tell me. I plan to make a decision within the week. I was leaning toward Aubagio, but now Gilyena looks more appealing; even with the six+ hour initial day of treatment. I mean, it was FDA approved for treatment for children. Who would market something dangerous for children?! Q: Is there any type of affordable leg brace out there to aid in keeping me upright while walking? A:, Didn['t really have time to talk much abut this, but was directed to Amazon to check out all the new-fangled, affordable options. Looking for something to lift the toes on my right foot. A: Erica immediately wrote out a script for both occupational and physical therapy with the assurance tht my insurance should cover a set number of visits. I made my appointments at Health Plex and will begin July 28. In a renewed attempt to fight this MonSter, I finally cashed in my Christmas gift certificate from my husband and treated myself to a massaged and reflexology session yesterday. That resulted in me rejoining the Tuscan spa in order to receiver a discount on monthly sessions. Of course, I cannot really afford this, but I've come to realize that MS is an expensive disease. I know what makes me feel better than what BIG PHARM can offer and I am just going to have to bite the bullet and sacrifice any other personal indulgences for the ammo I need to fight the beast. 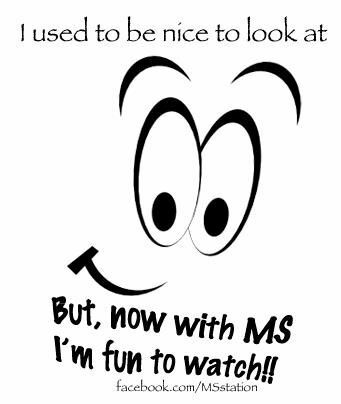 So, if selfish behavior is going to be my new norm, it is important to "spy" on MS Warriors with far better resources than I. Any attention given to MS research is applauded, especially when it comes from public names. Ann Romney has gone out of her way to highlight multiple sclerosis in the news. Thank you for using influences unavailable to us peons. Point to remember: We all put on our pants one leg at a time; be it Chanel or Walmart brand. So, that's my week. Still looking for Letters to the MonSter to include in my new book by that title. What would/do you tell this beast? Lisa "The Lady with the Cane"
Back on the grid and acting like Dory.